Last week was the 51 st Annual International Conference of the Association of Professional Fundraisers. 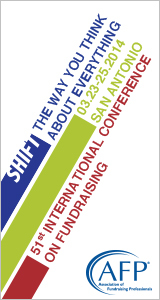 The theme was SHIFT  as in "shift your perspective and get a whole new focus on fundraising." The conference truly was international, with attendees from around the globe. London and Rome, Hong Kong and Japan, South America and South Africa, Australia and Alaska, and many more! Dozens of nonprofit thought leaders  including Tom Ahern, Penelope Burk, Simone Joyaux and Beth Kanter  shared ideas that inspired the nearly 3,000 of us fundraisers who were in attendance. SHIFT #1: Stop talking about who you are and what you do. How do you introduce yourself? I bet you say "I'm Friendly Fundraiser, and I work for A Great Nonprofit." Period. Maybe you add, "We're based in Some Location and we serve Some Number of people." Sure, who you are and what you do is good to know. But what's really important is WHY your organization does what it does...and WHY THAT MATTERS. If you're not sure why what you do matters, ask yourself "What would happen if my organization ceased to exist tomorrow? Who would be impacted? How would lives change? Shout out to Tom Ahern for this donor-centered communications exercise. SHIFT #2: Stop thinking about soliciting (fundraising) as selling. The easiest way to raise more money? Connect with what's already in your donors' hearts. Donald Calne, a Canadian neurologist, coined the phrase "Emotion leads to action." So, instead of "selling," focus on "telling." Tell your donors stories that are filled with emotion. Fear, anger, disgust, disappointment, sadness, happiness, hope, promise. You get the idea. Remember, most donors want to help one person. So tell them a story about someone they can help. Then tell them how their contribution will change that person's life for the better. High net worth donors (think Bill and Melinda Gates) and foundations want to solve larger problems. Tell them the same story, add the scale of the problem and the impact that their dollars will have. Tell these donors how LIVES will be changed with their financial support. Hat tip to Stephen Pidgeon for sharing ways to match your message to your donors. SHIFT #3: Stop saying "Thank you..."
No, I don't want you to stop thanking your donors. I want you to change the way you say "thank you." Great gift stewardship works for all donors...and it will lead to renewed (and even increased) contributions. Do you have different stewardship levels for the different amounts of gifts you receive? You should. Every donor deserves a thoughtful (and timely!) thank you letter. A higher level donor should also get a handwritten note or a phone call just to say thanks. Remember that saying "thank you" is just as important as making the "ask." Writing notes and making calls is a great way to get your board members involved in your organization's fundraising. Kudos to Sandy Rees for emphasizing donor segmentation as a retention strategy. Send me a message and tell me which of these "shifts" will inspire you to do things differently. I love hearing from you. Remember, there's more to grant writing than just "writing." There's also more to fundraising than just grants. This month, I'm sharing three presentations from the AFP International Conference. The slides are easy to understand, and their lessons will change how you think about fundraising. From About.me to Zillow. Using online tools and social media in fundraising. The Next Generation of American Giving. Matures, Boomers, Gen X and Y, oh my!